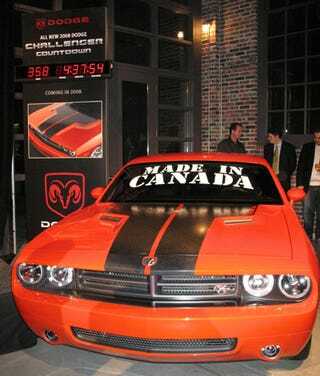 "The Dodge Challenger has a new home in Canada, and now a date in Chicago. At auto shows this year, the Challenger concept car will stand alongside a 'countdown clock', which will tally the days, hours, minutes and seconds before the production version is revealed at the Chicago Auto Show in February 2008. As of today - Feb. 14 - the wait is 357 days until reveal." Ooh, a clock — you can't have muscle car wars without a clock, can we?